I almost didn't photograph this outfit today. 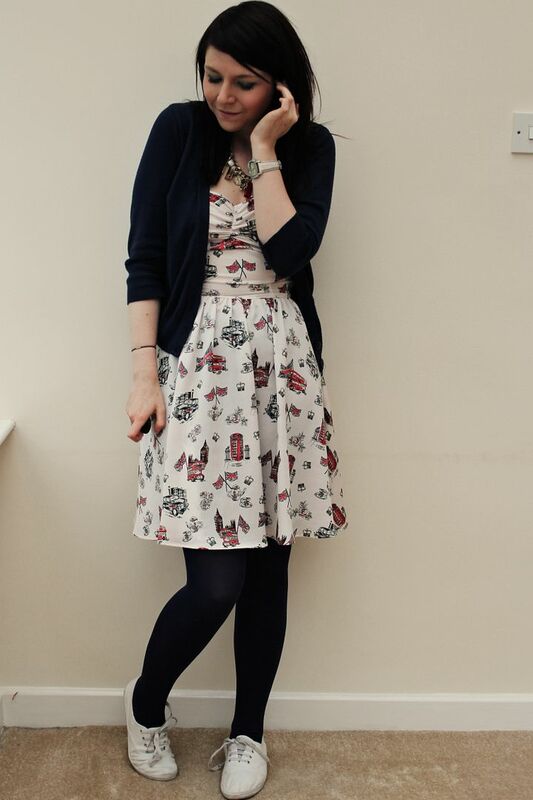 I wanted to try the navy tights with this dress and then I didn't want to go with navy shoes (invisible feet syndrome) and red flats felt too similar to yesterday, so I went for vintage Charlotte with navy tights and white pumps. I used to wear this combo a lot when I was in college. 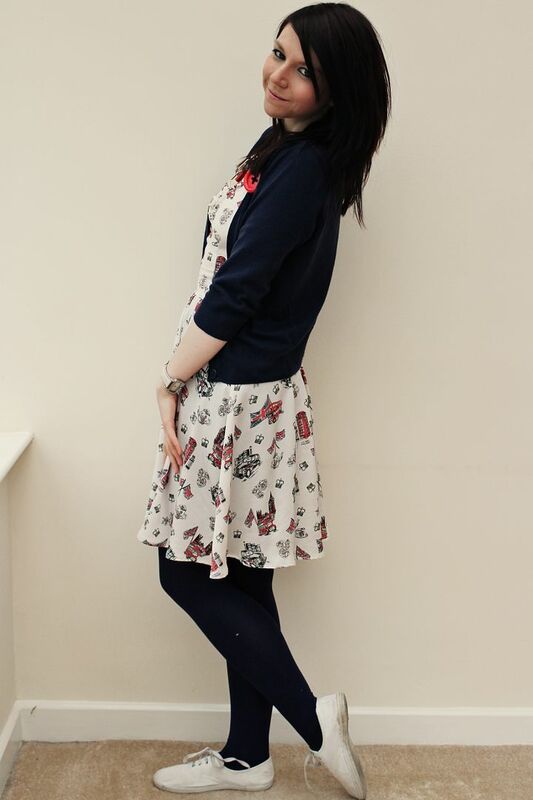 I also used to wear this cardigan a lot. So this whole thing just felt very me-aged-18. Which is crazy to think was a whole four years ago. I read blogs by girls who are 18 and can't believe how much older I am than them. I used to think I knew everything when I was 18. I had my first serious boyfriend, I was going away to uni, I had a great group of friends at home and didn't see the point in making more in Birmingham. I'd love to meet 18 year old me now and tell her everything that has happened in the last four years. That I would break up with my teenage sweetheart after long distance became too tough, that I would meet my soul mates in the form of my uni friends, that I would have the best year of my life on my year abroad, that I would start a fashion blog and have hundreds of people read it every day, that my degree would be hard work but the most worthwhile thing I had ever done, and that I would soon be going to New Jersey for 3 months and doing a 22 day road trip. That I didn't know everything, but that I would enjoy every minute of learning. It's astonishing to think about how much I've changed in the last four years, but it's definitely all for the better- or at least I hope! Well that really went off on a tangent, didn't it? 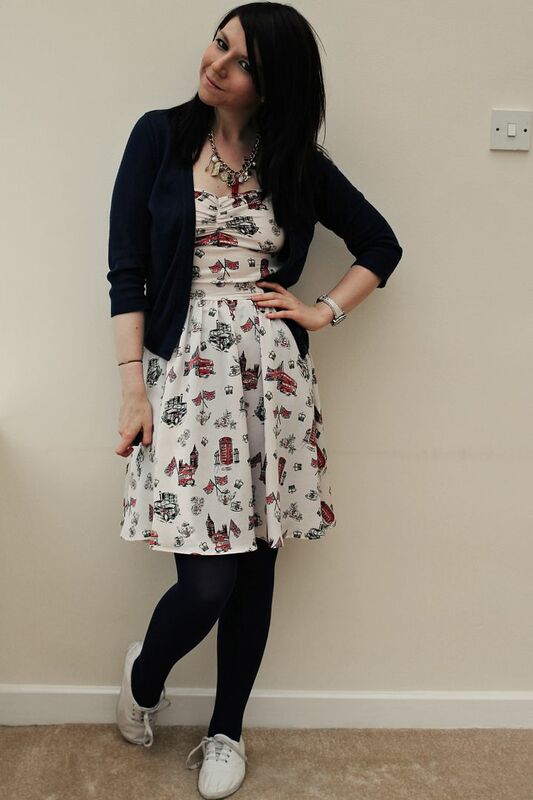 Jeez, I was only supposed to talk about white plimsolls and navy blue tights! Anyway, this was today's outfit. A super-casual, laid back way of wearing the dress. I have had so much fun wearing this dress all weekend (here are my outfits from Saturday, Sunday and Monday, in case you missed them! ), and I have the cost-per-wear down to £7.50 now haha. I've felt so proud to be British with the jubilee celebrations the last few days. I'm not the most patriotic person in the world, but England becomes this mythic, idealised place when I'm moving abroad and while I'm living abroad. I've always found Americans to be very interested to hear I'm from the UK and people would always come over and talk to me when I lived in Minnesota! I'm excited to meet lots of new people in New Jersey and on my road trip. 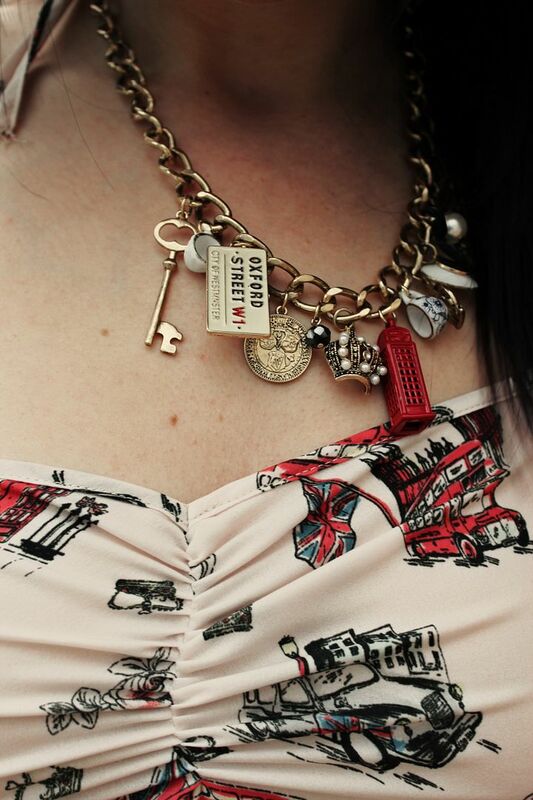 Speaking of patriotism, my Mum bought me this necklace today as a going away present. 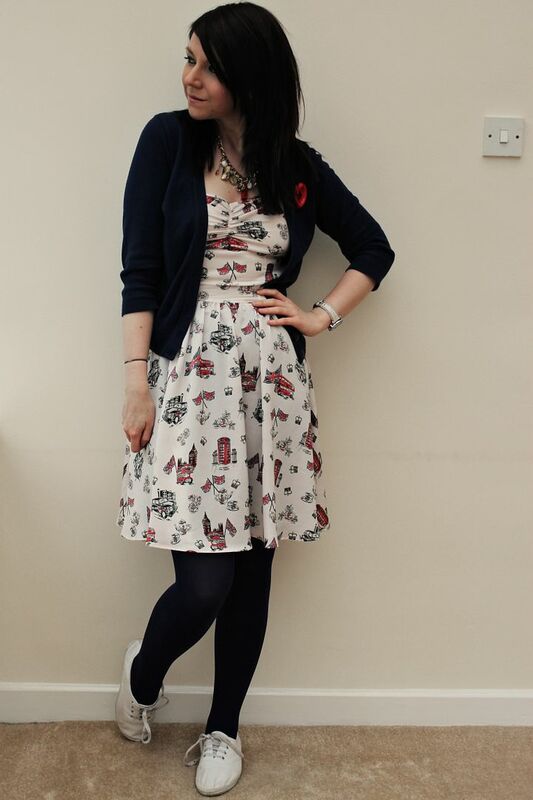 I know the British theme is kinda over-kill in this outfit, but hey, it's the last day of the jubilee weekend! I think it's absolutely gorgeous and can't wait to wear it while I'm away! I started packing today which was both scary and exciting. My blog is going to be quite different- I'm only taking about 40 items of clothing with me, so my outfit choices will be somewhat limited, and the heat will be a serious factor, but I am definitely going to continue photographing my outfits and running this blog, even if my outfits are super boring! I'm hoping the stories from my summer abroad will make up for a dozen ways to wear denim shorts! I hope all of you in the UK have had a lovely weekend, and I promise a different dress tomorrow! 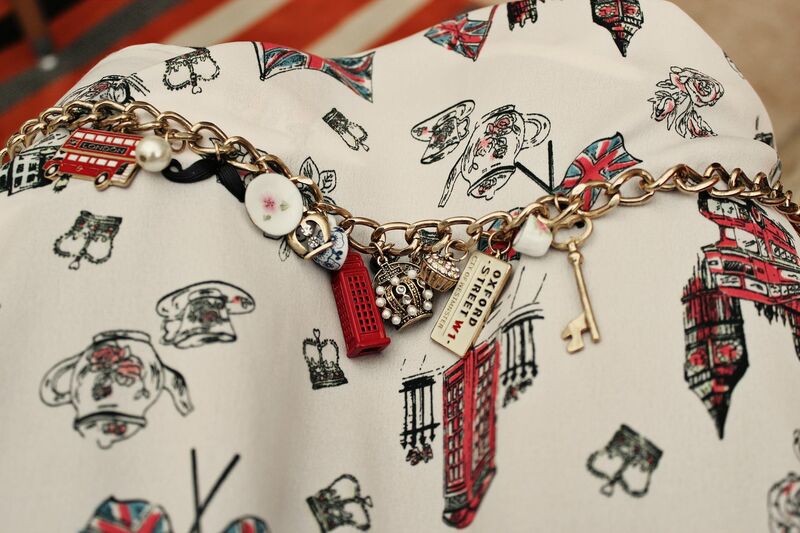 That necklace is really cute! This dress is amazzzzzing!! I love the print and the fit. Such a great combination of the navy, red and white. 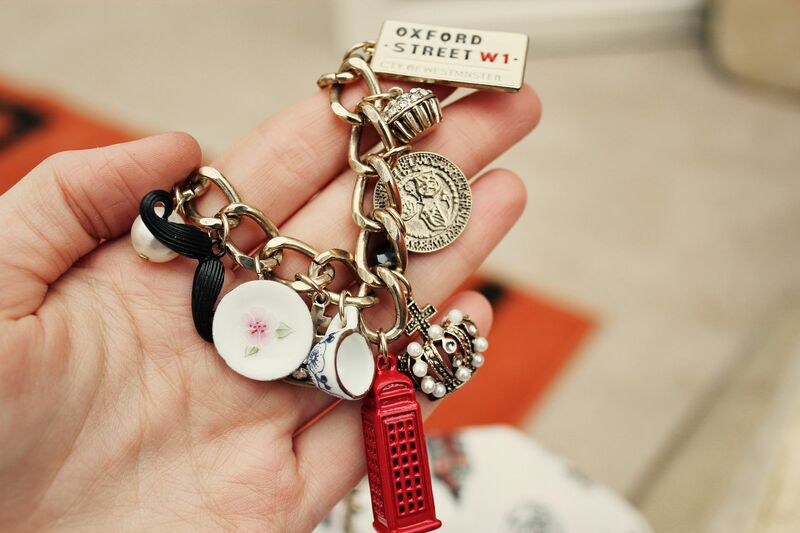 Great necklace too!